A sprig of valerian, a little mint, a few steps through the Gothic labyrinth – relaxation is already setting in. The wonderful monastery garden of the Abbey of St. John the Baptist is an oasis of calm, and it fortifies the visitor for the sights that remain to be discovered in Steingaden. 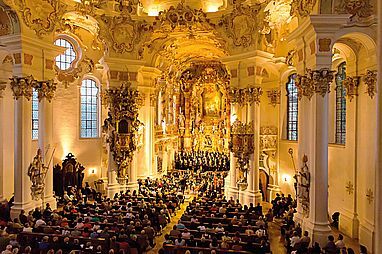 There’s the imposing Minster, known as the Welf Minster, the romantic market square, and finally, the Wies Church: in the early evening, when the rush has died down a bit and the light is shining gently through the high windows, the Rococo splendour is shown to perfection. A beautiful end to a fantastic day.